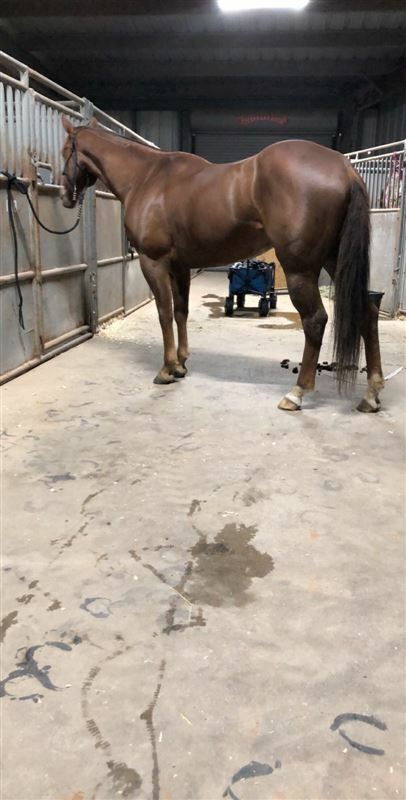 10 yr old QH, Sorrel Gelding, Not Registered.Seasoned 1D-2D Barrel Horse. Has placed in the top of the 1D with 600+ Runners & has won or placed in the top 3 in Jackpot races with 50+ Runners. Has Ran in ( Texas & Oklahoma ) Local & Sanctioned Rodeos too, Usually Placing in the Top 15 with 50+ Runners. SOLID / SOUND - Never Been Injured. No Alley Issues, No Bad Habits. I've had this horse since he was a yearling & we Trained him. He has been Trained, Ridden & Competed on by our Daughter, but because of other circumstances, She is no longer riding him. He is not registered and can't be registered. His Sire & Dam were both AQHA Registered and were ran on the track. I did not know their registered names. I had the Dam, she had a Lip Tattoo but I could not get the Reg Papers. We were not planning to sell this horse so we do not have all his statistics readily available. We are in the process of getting all the documentation together, that we can get. We have uploaded newer videos to this Ad & also to the Cantrell Ranch Performance Horses, YouTube Channel. We were planning to run him in some American Qualifiers this past Winter, but again, due to other circumstances, that didn't happen. He hasn't been ran since November 2018. There is nothing wrong with him, No Soundness / Health Issues, just gave him some time off. In the process now of getting him with a Trainer to get him legged up & ready to start running again. We don't have any videos of him going to the Left Barrel, first. We did have but, now we cant find them. I will have some New Videos soon. Please Read the Entire Ad. Thank You for Your Interest. I am Not Advertising or Selling This Horse as a Kid Horse. Our Daughter has ridden him since She was 13 yrs old & She is 18 now, but she knows how to ride. He is easy to ride but he does need an Experienced Confident Rider with Soft Hands & Soft Voice. He does better with Women. He is more of a Free Runner and he can run. He can go to the Left or to the Right. He prefers the Left. He is not a Bucker, Not Crazy or Nutty. He is Very Responsive & Quick.He likes to Run & He really puts his heart into Running. He has a great mind with a lot of speed and power. He knows his job & he does it well & he is still improving & getting better. He has been on Barrels for about 5 yrs. We don't start our horses fast. We start them slow & Build a Foundation. He has a Good Handle & a Light Mouth. He neck reins & moves off Hands & Feet. He has been trained to Turn & Flex off Inside Leg / Heel / Spur Pressure & Seat Pressure in the saddle. He has been used on cattle in Rough, Rocky Country. He knows where to put his feet & he knows how to travel, Rode in the Pasture checking cows, Crosses Creeks, Ridden on the road around vehicles, been on Trail Rides, in Parades. You can get on and off from either side and you can saddle him from either side. He doesn't care if the dirt is hard or deep, he runs on either. He has a Big Heart & a Lot of Try. He has ran in High School Rodeos, 4H Rodeos, 3 Day Barrel Races, Jackpot Races, Open & Sanctioned Rodeos. He doesn't have to be Exhibitioned before he is ran, he will go in and run.